Konerko's monster 2010 season made him one of the most coveted free agents this winter. No, I’m not talking about Donkey Kong video games. For those who don’t know, Adam Dunn’s nickname is the Big Donkey and Paul Konerko’s much unknown nickname is Kong (I don’t know why either). Add one plus the other with some minor subtractions and you have yourself a nice new nickname – Donkey Kong. Now we have that out of the way, it’s time to get down to business. In the past two weeks, White Sox general manager Kenny Williams has been a busy and free-spending man. After locking-up Adam Dunn for 4 years and $56 million and retaining A.J. Pierzynski for 2 years and $8 million last week, Williams brought back one of the most influential White Sox of all time – captain Paul Konerko. Konerko will continue to make the $12 million he has been making for the past 5 seasons for 2011 and 2012. He will make $13.5 million in 2013, but $7 million of that is deferred and to be paid from 2014-2020. The White Sox are committing 3 years and $30.5 million to Konerko over the next three years up front. That kind of contract expects Konerko to be at least a 2.5 win player every year for the next three years, with a total of 6-7 wins over the entirety of the contract. Even though Konerko is already 35 and the White Sox are paying him through age 38, this deal is fair and plausible. Konerko racked up 4.2 WAR last season in a career year offensively. Had his defense been better, he could have easily been a 5 WAR player. Personally, I don’t see Konerko as a -10 to -15 fielder like some of the advanced metrics do. He doesn’t have a lot of range, but he’s fairly reliable and is pretty good at scooping low throws at first base. I’d expect Konerko’s defensive numbers to increase over the course of the contract, as last year’s defensive numbers were probably more of an anamoly than anything else. Konerko’s never been worse than a -6.5 at 1B in his career and first base defense usually doesn’t deteriorate as much with age. Adam Dunn will take his home run hitting skills to the South Side. Offensively, I don’t expect Konerko to repeat 2010 and I don’t think anybody else does either. Konerko had one of the better offensive seasons in White Sox history with a wOBA of .415 last season. However, his career wOBA is .366 and his highest wOBA prior to 2010 was .395 in 2006, when he was still in his prime. Konerko’s career year at age 34 is very hard to explain. Health is one thing to look into, as Konerko has been bothered by a chronic thumb injury since 2007 and last year was the first time where that injury wasn’t a big problem. Another explanation is just straight up luck. Konerko did post the highest BABIP of his career at .326 (he also posted this in 2006). Konerko’s batted ball rates were extremely similar to those of 2009, where he had only a .282 BABIP. That could explain the rise in average, but it definitely doesn’t explain the rise in home runs and the 60 point increase in ISO (Isolated power). Maybe it’s a little bit of both. Perhaps, we won’t see Konerko hit over .300 again, but we might still see 30-35 home runs from him over the next two seasons with a slugging percentage over .500. The Bill James Handbook (usually pretty optimistic) pegs Konerko for a slash line of .273/.361/.496 and 32 home runs in 2011. I think those projections sound pretty accurate and if Konerko were to return to his career norms on defense, he will definitely be a 3 win player in 2011. Speaking of projections, here are the projected wOBA of the projected 2011 White Sox starting lineup (taken from the Bill James Handbook). Besides Brent Morel’s overly optimistic projection, everything looks within the realm of possibility. When analyzed, this lineup projects to score 5.15 runs per game, that’s 835 runs over the course of 162 games. Last year, the White Sox scored 752. The addition of Adam Dunn (replacing Kotsay and rotating DH friends) and Morel (replacing Teahen and señor citizen Vizquel) adds about 80 more runs of output to the White Sox lineup. The 835 run mark would have been the second most amount of runs scored in all of baseball last season. Edwin Jackson's strong showing in two months with Chicago might be a preview of things to come in 2011. Defensively, nothing really changes. If Quentin can heal from his foot injuries, he might not be a horrible outfielder. Plus, Morel has been touted as a good defender in the minors, so he replaces the 3B revolving door of Teahen and Vizquel. Overall, this is a mediocre defense. Rios, Pierre, and Ramirez are highlights, but everybody else is either mediocre or flat out bad. What does this all mean? Well, in what’s now a pitching dominated league, the White Sox are projected to have one of the most potent lineups in all of baseball. Whether these projections are right or wrong is a debate for later. But on paper, things sure look good if the White Sox can pitch like they did in 2010 (702 runs allowed). It’s still very early in the off-season and the Sox still need to fill a couple of holes in the bullpen. However, as of right now, the Sox are looking at a 5-6 win improvement from 2010, making them a prime candidate to win around 93-94 games (88 + 6 = 94) in 2011. With a payroll nearing $120 million, the White Sox should be expected to win in 2011. It looks like Jerry Reinsdorf and Kenny Williams are going all in this year. Ryan was great with the glove in 2010 with an 11.5 UZR, but not quite as sharp with the bat. All the hot stove season has finally started. Now is the season for the couch chair GM’s to make their proposals and start trying to piece together who they think will be the best possible team for the 2011 season. This will be my first installment of how I feel the St. Louis Cardinals should attack the offseason. Part 1, Middle Infield. In House General Manager John Mozeliak has said that he is more inclined to get an upgrade at shortstop than second base. Quite frankly, this is baffling. 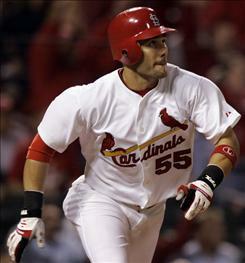 Skip Schumaker’s best attribute is his gritty play. Unfortunately, their is no stat that measure’s a players grit. I disagree with with wanting to move Brendan Ryan, one season removed from posting a 2.7 WAR from FanGraphs or 3.4 WAR if you are a baseball-reference guy. He did this in 129 games. If you were to extrapolate this over a 155 games (about what a fulltime player would go through), that is 3.3 WAR (FanGraphs) and 4.1 WAR (B-R). However, poor Brendan Ryan had a dismal season with the bat in 2010. Conversely, he was the best defensive shortstop in 2010 (11.5 UZR!!). It should be mentioned that Ryan had offseason wrist surgery right around the beginning of spring training. If you were to normalize his 2009 season and 2010 season, your looking at a solid(albeit unspectacular) .260/.310/.385 sort of player. The real benefit to playing Ryan is naturally his stellar defense with a team that features Jaime Garcia (56% ground ball rate), Jake Westbrook (career 59% ground ball rate), Chris Carpenter (never had a season with St. Louis with a ground ball rate under 51%), and Adam Wainwright (perhaps the only pitcher on the staff who could be called a “strike-out pitcher”-career 49% ground ball rate). If I could get my pick, Ryan would open the season as the starting shortstop. Not every team is as fortunate to have their own black hole. The Cardinals are lucky, they have two of them (I’m referring to second base and third base but 3B is a topic for another day). Skip Schumaker was abysmal last season. Skip is the owner of -13.2 UZR at 2B. That is Adam Dunn territory right there. He didn’t do much with the bat either (.265/.328/.338) but was a .300 hitter the past 3 seasons so I tend to think this season was a bit of an aberration with the bat. This still doesn’t excuse his terrible defense at second base. Skip was one of few players with a negative WAR last season at -.2. Last season, when he was a .300 hitter, he still had abysmal defense and posted a near replacement level 1.5 WAR in 586 PA’s. His best asset to the team would be as the first man off the bench and as 4th/5th outfielder-the role he belongs in. Unfortunately, he is one of the popular kids in the playground and has Tony La Russa’s seal of approval. Obviously he won’t come out and say the skip-experiment at second base was a failure but that is what has transpired. He must be replaced. II-the farm. The Cardinals farm features some pretty unspectacular options. The only half hearted reasonable options are Dan Descalso who projects to be at best an average second baseman defensively with “doubles-power” at the position. His ceiling reminds me of a David Eckstein type. The other is the gifted Tyler Greene. Greene features plus tools almost across the board but can’t put everything together. Now is do or die time for Greene. He is out of options and this could be his last chance to make something out of his talents. II A- the Free Agents. This years middle infield free agent class is a very underwhelming group. The only options that are even somewhat enticing are as follows: 3b/ss Miguel Tejada, Swiss Army Knife Bill Hall, and 3b/ss/2b Juan Uribe. This is the cream of the crop. I feel if we are to upgrade the middle infield, it must come through trade. However, the idea of having an insurance policy such as Bill Hall and Juan Uribe fills the cardinals needs very well. They had a thin bench and it became exposed with Ryan’s down year, Schumaker’s being Schumakerness, and Freese’s injury. Unfortunately, both of these guys will probably be looking for more of a full-time role and I just don’t think they will find that in St. Louis. II-B Non Tender- This person has got me very intrigued. Shortstop JJ Hardy seems to be flying under the radar. Overall, he had another down season with injuries but had a very productive second half of the season. He quietly hit .304/.363/.442 in 56 games after the allstar break (this was probably a bit inflated by his .340 BABIP). He might be nontendered by the Twins because of his $5MM dollar salary, which he would probably receive a raise on. If JJ were to come into the fold at about a 1yr/$3MM dollar investment, I say go for it. Honorable mention: SS Jason Bartlett.Although a career .300 hitter, Schumaker slipped in 2010 with the bat, and the glove. A career .300 hitter, Schumaker fell with both the bat and glove in 2010. III- trades Jose Reyes leads my wish list for Christmas. He has the high salary($11MM) but might be just the investment the Cardinals could be looking to make. The Mets are basically in a rebuild mode and should be looking to move some players. Thats not to say they will be just handing their talented players out like candy on Halloween, however. If we were to examine the New York Mets needs, we might be able to find a potential match. They could be in the market for some bullpen help, an outfielder, and a second baseman. Unfortunately, the Cardinals are also in the market for a second baseman but lets pretend for now that they don’t intend to give Descalso or Greene a chance for that role and will use them as trading chips. The Cardinals farm system as a whole, well, it isn’t the most stellar group. However, the feature one of the strongest relief cores out their with Adam Reifer, Casey Mulligan, Eduardo Sanchez, and Fernando Salas. All of whom could be helping the Cardinals in 2011 at some point. At the major league level, they have flamethrowers Jason Motte and Mitchell Boggs. Perhaps a package of Motte, Mulligan, and the met’s choice of Jon Jay or Allen Craig. Would it work? Maybe. Another name to consider is Arizona Diamondbacks’ Kelly Johnson. 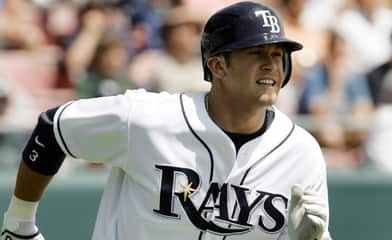 Kelly had a resurgent 2010 season where he hit .284/.370/.496. People can point out to him being a “Chase Field product”, but if they did a little more investigation to his time in Atlanta, we can see that he has naturally fluctuating H/A splits. Even if we were to get the 07-08 version of Johnson, I would be down with that. He would provide an upgrade on both offense and defense. Arizona has some pretty obvious needs. Most notably the bullpen. Seeing as Johnson is just a one year rental, I could see a package of Mitchell Boggs+ their choice of Casey Mulligan/Adam Reifer along with former top prospect Blake Hawksworth who doesn’t seem to have a future with St. Louis as the throw-in. The Cardinals middle infield was a very underwhelming group and their are some pretty underwhelming solutions. However, an upgrade can be done in a variety of methods.